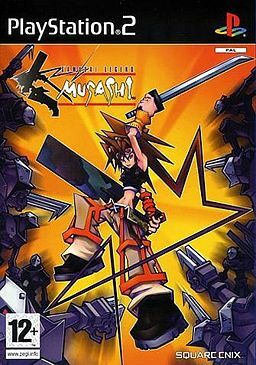 Musashi: Samurai Legend, known in Japan as Musashiden II: Blade Master (武蔵伝II ブレイドマスター, Musashiden Tsū Bureido Masutā, "The Legend of Musashi II: Blade Master"), is a third-person action game developed and published by Square Enix in 2005 for PlayStation 2. Much like its predecessor, Brave Fencer Musashi, the game involves real-time combat in a 3D environment, and character designs by Tetsuya Nomura. The game was released in North America, Japan, Europe and Australia. Musashi is primarily an action game, in which the player controls Musashi and fights enemies with sword moves. The character roams around a world in full 3D, moving in real time at will. They have two swords: the standard katana and a larger blade, which changes as the player progresses through the game. Short attacks and attack combos are performed with the katana, while the large blade is used for finishing attacks, slow hard-hitting attacks, or sword-specific special attacks. The player can use the swords to block attacks, and can "focus" on enemies to learn techniques that they are using. Many quests involve rescuing characters; when doing so, Musashi physically carries them, and in combat uses them as a battering ram or throws them in the air to perform attack combos before catching them again. The game's role-playing elements are limited to experience points, earned by defeated enemies, which are used to increase attributes like attack power and defense. During the course of the game, the player travels around the game world performing quests; the world is centered around a single city, and Musashi journeys out from there to perform either the linear series of quests in the main plotline, or small side quests generally involving rescuing villagers. In addition to the regular gameplay, there are short segments involving motorcycle or airship combat, taking place on a set path rather than free-roaming. In the city of Antheum, carried by a magical beast called Anthedon (a large skybound whale), young Princess Mycella prays in the mystic Chamber of Rites to summon a hero who will save her world from the growing threat posed by Gandrake Enterprises. However, Rothschild interrupts the ritual, which causes the summoned hero – Musashi – to land just a bit off course. He's found by old martial artist Master Mew, who immediately takes him under his wing. Once Musashi is ready, Master Mew sends him into the heart of evil Gandrake Enterprises to rescue the captured Princess and thereby save the world. Unfortunately for Musashi, President Gandrake kidnaps the Princess again to further the plots of his evil corporation to excavate the world's supply of nebulite and use the Mystics power to power his nebulium engine. To stop Gandrake, and ensure that he can return to his world, Musashi goes in search of the five Maidens that protect the five magic swords that have been lost in order to restore power to a mythical creature known as the Anthedon, which houses the city of Antheum. Along the way, Musashi has to smash his way through Gandrake Enterprises's endless swarms of killer robots and directors, as well as native monstrosities, but also an ancient evil waiting to plunge the world in eternal darkness. After destroying the ancient evil, rescuing the maidens and collecting their swords, and saving the princess from Gandrake, Musashi is able to return to his world. The music of Musashi: Samurai Legend was composed primarily by Masashi Hamauzu and Junya Nakano, with a few contributions from Yuki Iwai and Takayuki Iwai of Wavelink Zeal. The Surf Coasters, a Japanese surf band, provided the main theme, "Samurai Struck". The original soundtrack "Musashiden II: Blademaster Original Soundtrack" was released on July 21, 2005. Another album was released by the Surf Coasters which featured a full version of the opening theme. Musashi: Samurai Legend sold almost 58,000 copies during the week of its release in Japan. By the end of 2005, it sold over 91,000 copies in Japan. The game received mixed reviews overall from critics. The graphics were generally praised, but criticized for inconsistent frame rates: IGN called the "manga-shading" style "a neat trick", and GameSpot noted that it was a unique visual style, but both criticized the frequent slow-downs and IGN further criticized the repetitive environments. GameSpy felt that the graphics themselves were inconsistent, with good character designs but with environmental designs mixed between good and poor, depending on the area; 1UP.com, however, said that the graphics "were tough to criticize". Other aspects of the presentation were criticized: both GameSpy and GameSpot heavily panned the dialogue and voice acting, with GameSpot stating that the voices were poorly done and did not fit the game. IGN added that the game's "surf-rock score... barely makes sense". GamePro also disliked the game's camera system, saying that it worked for outdoors areas, but was difficult to control and see anything for indoors or arena areas, a point with which GameSpy agreed. The gameplay also received mixed reviews: while several reviewers, such as GameSpy and GamePro, praised the gameplay as fun and exciting, GameSpot found combat to be too easy, making most of the gameplay elements pointless as basic attacks were enough to win most battles. IGN heavily criticized the "slow movement and long drawn out gameplay with too much backtracking", and even GameSpy's otherwise positive gameplay review called out Musashi as moving very slowly. The plot was largely ignored by reviewers as a serviceable platform to base an action game on—GameSpot termed it not especially deep, while GamePro felt it had enough characters and twists "to keep things moving along". 1UP.com and GameSpy concluded that the game "generally doesn't live up to the stature" of the previous Musashi game. ^ Gantayat, Anoop (October 2, 2007). "Nomura Discusses Kingdom Hearts". IGN. Retrieved January 25, 2010. As mentioned in previous interviews, the game [Birth by Sleep] is being developed in Osaka by the same team that developed Musashi Samurai Legend and Re: Chain of Memories. ^ a b c d e f Massamilla, Bethany (2005-03-22). "Musashi: Samurai Legend". GameSpot. Retrieved 2015-12-08. ^ a b c d e Kohler, Chris (2005-03-15). "Musashi Samurai Legend". 1UP.com. Retrieved 2015-12-08. ^ "Musashi Samurai Legend (ps2: 2005): Reviews". Metacritic.com. Retrieved 2009-04-01. ^ a b c "Review: Musashi Samurai Legend". GamePro. 2005-03-14. Archived from the original on 2007-08-04. Retrieved 2015-12-08. ^ a b c d e f g Fischer, Russ (2005-03-15). "Musashi Samurai Legend". GameSpy. Retrieved 2015-12-08. ^ a b c d Lewis, Ed (2005-03-14). "Musashi: Samurai Legend". IGN. Retrieved 2015-12-08. ^ Freund, Josh (July 15, 2005). "News - Japan: Weekly software sales for 7-4/7/10". GamesAreFun.com. Retrieved 2008-12-20. ^ "2005年ゲームソフト年間売上TOP500" [2005 Game Software Annual Sales Top 500]. Famitsū Gēmu Hakusho 2006 ファミ通ゲーム白書2006 [Famitsu Game Whitebook 2006] (in Japanese). Tokyo: Enterbrain. 2006-05-15. p. 378. ISBN 4-7577-2814-X. Archived from the original on 2015-06-27. This page is based on the Wikipedia article Musashi: Samurai Legend; it is used under the Creative Commons Attribution-ShareAlike 3.0 Unported License (CC-BY-SA). You may redistribute it, verbatim or modified, providing that you comply with the terms of the CC-BY-SA.